Save on science lab equipment and supplies from Hertz Furniture. Our professional Hertz Design Center team will sit down with each school and come up with a tailor-made plan to match their physical resources and budget. 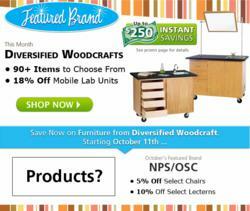 Hertz Furniture, the premier school and office furniture supplier, has announced an 18% off sale on over 20 Diversified Woodcrafts’ mobile lab units for the month of September. Hertz Furniture carries 98 items from Diversified Woodcrafts, a leading producer of quality lab furniture for over 35 years. Their inventory includes mobile and stationary lab stations, lab tables and desks, demo carts, lab storage cabinets, and more. Durably constructed and proudly made in the USA, all products are SEFA 8 certified and come with a complimentary Limited Lifetime Warranty courtesy of Hertz Furniture. With summer winding down and the fall semester heating up, Hertz Furniture is wasting no time in helping schools gear up for the scholastic year ahead. With Hertz Furniture's wide selection of quality lab furniture, schools are able to fully equip their science lab rooms or instantly transform an average classroom into a working lab by investing in compact, portable units which take up little storage space. Diversified Woods mobile lab units feature specialized safety features to keep science equipment safe, chemical-resistant table tops and finishes, and environmentally friendly UV finishes. A Hertz Furniture Featured Brand, Diversified Woodcrafts is included in the Hertz Furniture Instant Savings Program. Buy at least one Featured Brand item and get $25 in Instant Savings for every $1000 order, with the opportunity of earning up to $250 in Instant Savings. "Hertz Furniture is committed to helping schools design the ideal science laboratory for their students," says Hertz Furniture president Saul Wagner. "Our professional Hertz Design Center team will sit down with each school and come up with a tailor-made plan to match their physical resources and budget. Many of our lab workstations are designed to serve students with special needs and can be used in a lab or for standard classroom demos. The students of today are the scientists of tomorrow, and we take great pride in continuing to partner with schools by offering quality furniture at the best prices." For over 45 years Hertz Furniture has supplied schools, religious institutions, businesses and government offices with top quality commercial furniture and superior customer service. Speedy Quotes, Quick Ship products, a wide selection of Eco-Friendly furniture, a free Project Planning and Design service and the best warranties in the industry are just a few of the ways that Hertz Furniture provides added value to its customers. For additional information on Hertz Furniture and its extensive line of products, please visit Hertz Furniture, speak to a furniture specialist at 888-802-6549, or send an email to jonathanyunger(at)hertzfurniture(dot)com.